"For the last 8 months Marc has assumed [the role of Interim Director of Development] with my agency. I can tell you that the turnaround in this department has been remarkable. The staff have not only 'gelled' but have really learned to do their job. Marc has provided them with training, direction, oversight, and much needed support. Our fundraising has exceeded its goal for this year and continues growing." "Marc turned out to be the catalyst which turned the cathedral around financially. For all of us heree his careful and thorough leadership was a positive experience from which the Cathedral continues to benefit." 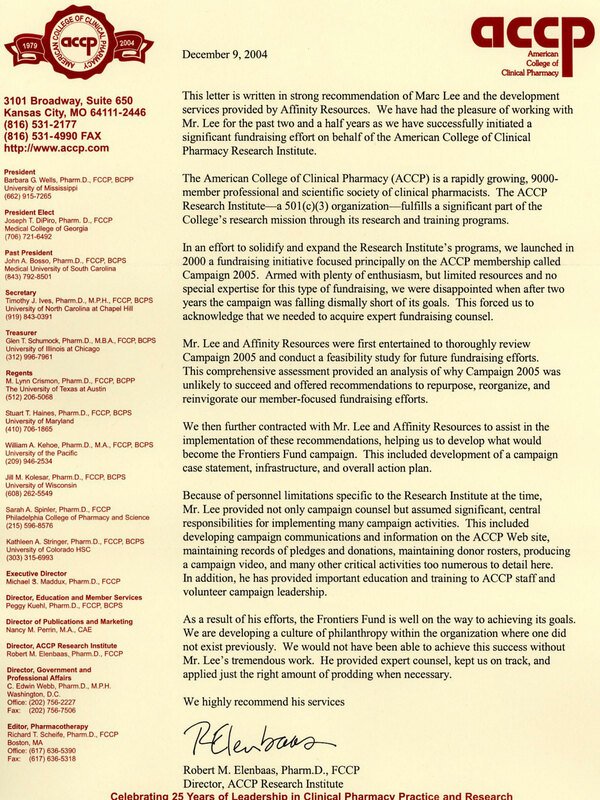 "Marc Lee was a delight to work with from the very start of our [fundraising] audit. I was most impressed with his extensive knowledge of fund development and years of hands on experience. It showed in the final report, which was well written, comprehensive and direct. Because of this excellent product we are now able to do some critical strategic planning for our fund development programming." "Marc Lee's work with and advice to Health Resource Partners has been both significant and important to us as we have developed our Internet Marketing. Marc played a key role in helping us get started. Working with Marc is delightful. He is responsive and agreeable, always looking for ways to help us improve. That's certainly a part of why we have continued to work with him for over four years." "The Metropolitan Alliance for Adult Learning hired Marc Lee as a consultant to develop an Internet-based communication strategy for our constituents. It has been a pleasure to work with Marc. He is a consumate professional. His work for the Alliance has been timely, accurate and complete. He has pushed us to think in new ways about how we communicate with our constituents and has kept us on track." "We have had the pleasure of working with Marc Lee for the past two and a half years as we have successfully initiated a significant fundraising effort. As a result of his efforts, the Frontiers Fund is well on the way to achieving its goals. We are developing a culture of philanthropy within the organization where one did not exist previously. We woiuld not have been able to achieve this success without Mr. Lee's tremendous work. He provided expert counsel, kept us on track, and applied just the right amount of prodding when necessary. We highly recommend his services." "Marc Lee is a knowledgable and experienced consultant. It is a pleasure to recommend him and the fundraising consulting services of Affinity Resources." "I am pleased to recommend Marc Lee as an expert consultant and facilitator in the strategic planning and visioning process.... He worked us through where we had been and where we wanted to go...[and] helped us to identify strengths to build on challengs that needed to be addressed." "In Marc I think any agency would find an engaging mind and willing and earnest heart. He understands the importance of relationships among investors, of refining internal and external communications and how the building of strategic partnerships is perhaps one of the most important assets one can bring to an organization." "Marc saw us through a lengthy process in which he helped define our need to redesign and add to our existing web site. Marc was involved in helping us apply for funding before getting to the real work of [adding] a large online database. Marc's work was accurate and always met the deadlines he promised. The database is flexible and has receive an enthusiastic response. The Christian Community Foundation in Kansas City is pleased to have partnered with Marc and Affinity Resources."